Street parking & a parking lot is also available. We are blocks from SEPTA's Glenside train stop, and right at Keswick and Easton Roads. So all the buses that run on Easton Road can take you to Dino's Backstage. Check our website for the most current schedule of performers. You can enjoy "finer dining" in the glamorous main dining room, or have dinner and catch a show in "The Celebrity Room", a separate show room with entertainers singing songs from The Great American Songbook, comedy nights, and various ways to be entertained. 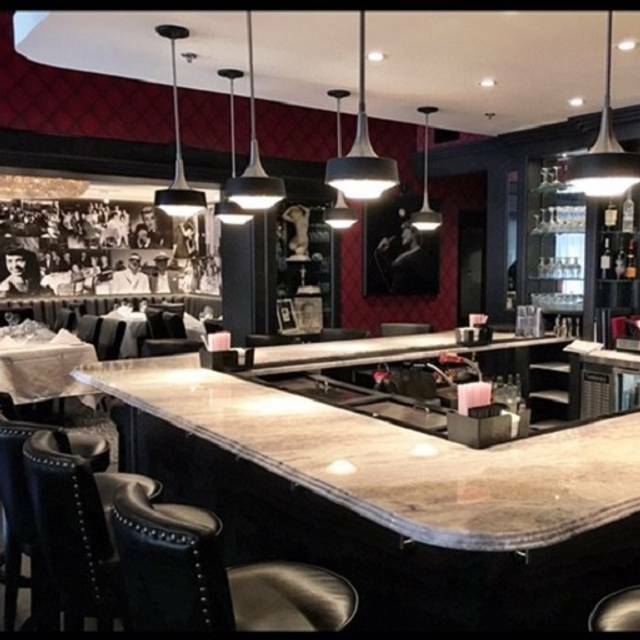 We also have a beautiful bar that seats 12 guests, and a seasonal patio with dining al fresco and a lounge. 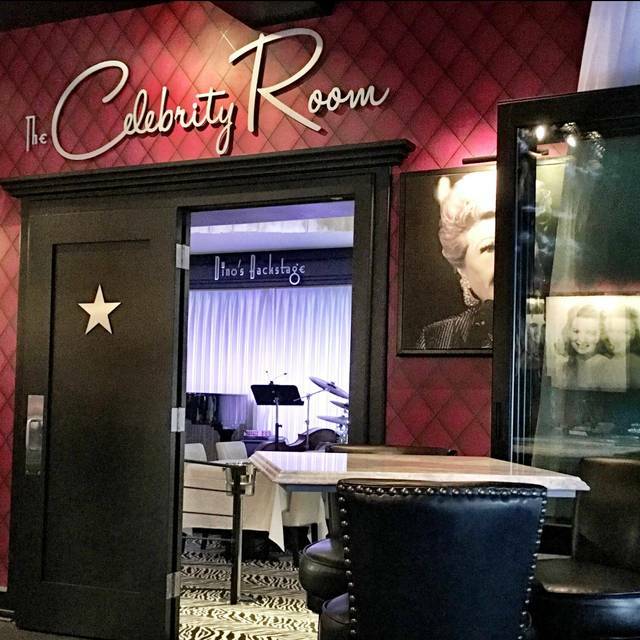 In "The Celebrity Room" there is a varying ticket charge depending on the entertainer, and a $20 food & beverage minimum. Please call & check availability for The Main Dining Room, because seating through OpenTable is limited. 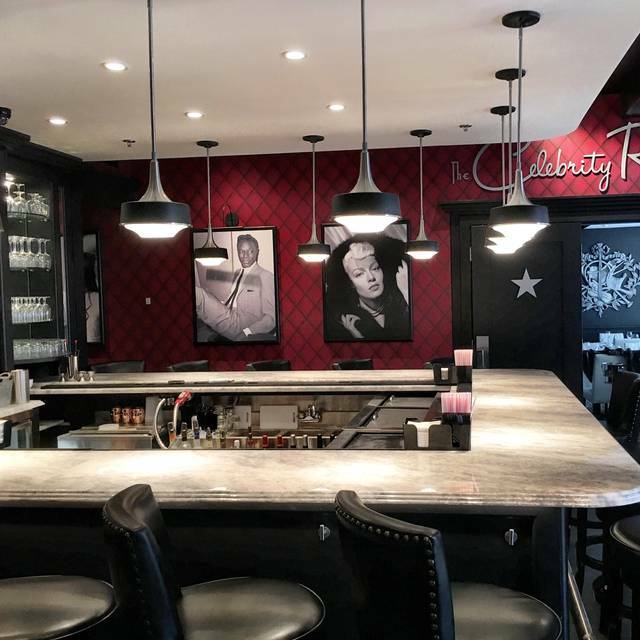 Also, you are no longer able to make reservations for "The Celebrity Room" through OpenTable. So, please call 215-884-2000 to make reservations for dinner in our main dining room, or to reserve your table and to purchase tickets for a show in The Celebrity Room. Great place, great people. Wonderful owners. Beautiful interior. It was fabulous! The ambiance was perfect. The food delicious and authentic. We will be going back! Much improved from our last visit. Excellent service. Delicious food. Highly recommend tuna poke - amazing. Wonderful meals and service. All 4 dinners were cooked perfectly. Definitely will go again. We went before a show. The people next to us were seated at 605, and by 730, there food was still not out. The restaurant should have picked up their tab considering they had to rush through their meal to get to the show, and everyone around them, who had been seated after them, had already eaten. We were a little late for our reservation, so I knew right then we’d have to rush through our meal. However, we ordered appetizers right away, and when I said I needed just another minute for my food, I was urged to order or it would “be really backed up”. For the cost of the meal there, which was mediocre at best (I was recommended the gnocchi and it was not good. Mushy. And I’ve had a lot of gnocchi), it would have been nice to enjoy it a little. The place was super cute, and I’d be tempted to try it again when there was not a show, but hope they’d be better prepared next time. Dinner at Dino's before a show at the Keswick is perfect, except for the price tag. Food was excellent except for a remarkably bland, diner-grade Caesar Salad. 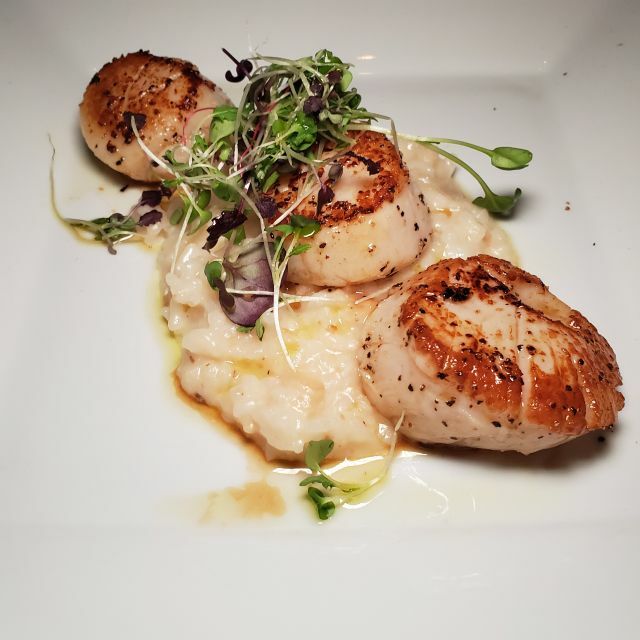 Other Appetizers and Sea Scallops with Risotto were delicious. Even the rolls were delicious. Our server, Brian, was very attentive and professional. My only hesitation at going every time is that it cost more than the concert (really), without cocktails. They also neglected to register my attendance with OpenTable, so I got the dreaded You Didn't Show Up email from OpenTable. I'm sure that will be resolved, but make sure to mention to the host(ess) that you have an OpenTable reservation. Food was great. Wish we had more time to enjoy it but we had tix to a show. What an amazing evening. Food was fantastic. Definitely one of my all time favorite restaurants. We drove from Manhattan on a friends recommendation. We had dinner and then went into the cabaret room. They sat us behind the piano where we could not see anything (even tho we'd made a reservations months before) and didn't even attempt to help us. We paid for a show that we could not see and management didn't care. They surely took our money! AND - they rushed us out. They made an announcement that we had to get out by 930 (from an 830 show) and shoved a check on our table before the show ended and before we finished our drinks. Beautiful decor - wonderful food - sadly I would never go there again nor would I ever recommend Dino's to anyone. A complete waste of a 2 hour drive from Manhattan. Management should be ashamed of themselves. And to top it all off - they told Open Table that we weren't there!!!!!!! Funny that we have our receipts to prove that we were but they insist we didn't keep our reservations. It was a very nice place. It was next to the theatre that I was going to. I would go there again even if I wasn't attending a show. The food was great and the service was great. Under staffed with no consideration for the value of their patron'S time. Angelo was Amazing as our server. Food was exceptional. Definitely going back. Dino’s has a fun, ‘old Hollywood ‘ ambiance. Food is very good, but the cocktails are fabulous! Tables are very close together and the bar is lively/noisy, so not a good choice for a romantic date but perfect before or after a show at the Keswick Theater next door. We’re planning to return to check out their live entertainment. The food is delicious. Service was excellent. The setting is like an intimate 1940’s supper clubs. Delicious pasta and cocktails and attentive service! Tremendous Service, Great Food, Great Location....What Else Could You ask For!! It was excellent food and wonderful service! My husband and I went for Valentine’s Day. Food was absolutely amazing! Service was great! They really have s great chef! Food is like a center city restaurant! Keep up the great work! Came for Valentine's Day dinner and performance. Wonderful food, service, performance, food - will always come back again. Once again, I had an enjoyable dining experience at Dino's with my date. We were a little bit late for the reservation, but were accomodated as soon as we arrived. Although I'd eaten at Dino's several times before, this was my date's first time. He really had a good time. We started with a Caesar salad that was enough for the two of us to share. Our meal was delicious, we both had salmon. The roasted cauliflower was soooo tasty. We weren't that thrilled with the broccoli rabe though. Our server, Brian was friendly and attentive. We were all done just in time for our show at the Keswick next door. Dino's is one of my favorites! Awesome service and nice atmosphere. Seating was tight but my husband and I enjoyed our conversations with the table seated next to us. Will definitely go back. Wonderful ambiance at this restaurant. Menu items were varied and inventive. Food itself was excellent. I had to send my salmon back as it was very under cooked, but they made it right. Tables are small and area is relatively cramped. But the quality of the food does make up for that. I would definitely go again - especially when attending an event at the Keswick Theatre - which is right next door to the restaurant. Gianna our bartender/server was AMAZING! Very informative about the menu, attentive and friendly. Food is delish! I HIGHLY recommend Dino’s! Perfectly prepared classic food in a wonderful ambiance and to top it off, first rate entertainment! Really great vibe and supremely delicious food. Small menu, which I love because they do everything absolutely perfectly. The scallops were incredible!! We had a great time. I was happily surprised by the glamorous decor. The food was good. The show was funny. What's not to like? I want to go again. Very nice place for dinner- they didn’t overuse garlic and portions were generous. Very accommodating wait staff who were very professional. If your looking for intimate dining with delicious food, look no further. Upscale dining in a setting brimming with memories of a golden era. If you are seeking entertainment, check their website for weekend nightclub acts. You will have a memorable dining experience should you dine at Dino's. This Minnesotan will be back on our next trip to Philly! great location directly next door to the Keswick Theater. Ample parking so it makes for a nice theater experience. We went before a concert at the Keswick next door. Service was great. The menu is limited and there were two items unavailable that evening. Portion size was small on the salmon. Charcuterie appetizer was disappointing. Drinks were good and despite the iffy food experience, we will go back for the atmosphere and give it another chance. We enjoyed dining here, prior to The Hooters show at the Keswick Theater.